Lindsey Graham appeared to absolutely dominate his fellow mini-debaters on Wednesday evening — especially on foreign policy subjects, where he plainly outshone everyone else on the stage at the Reagan Presidential Library. But it seemed that the American public most picked up on Graham's comments about one of the only things that can unite the country: beer. I don't know about anyone else, but I immediately thought about beer pong with Lindsey Graham. His sense of humor was on a roll, and he was sure and steady in the delivery of all his comments. He frankly trounced his competitors. Plus, he apparently loves to drink. What more could one want from a beer pong partner? I imagine that the Graham redecoration of the Oval Office would include a keg stand and a glorious beer pong setup, complete with custom glasses bearing portraits of all the Republicans who dared cross him in the debates. Or maybe to be more "of the people" he'd go on ahead and embrace the (Republican) red cup setup. Either way, you get pure Graham glory. In fact, I think the best way to determine which undercard candidate will get to appear in the next debate should be decided with a beer pong tourney. 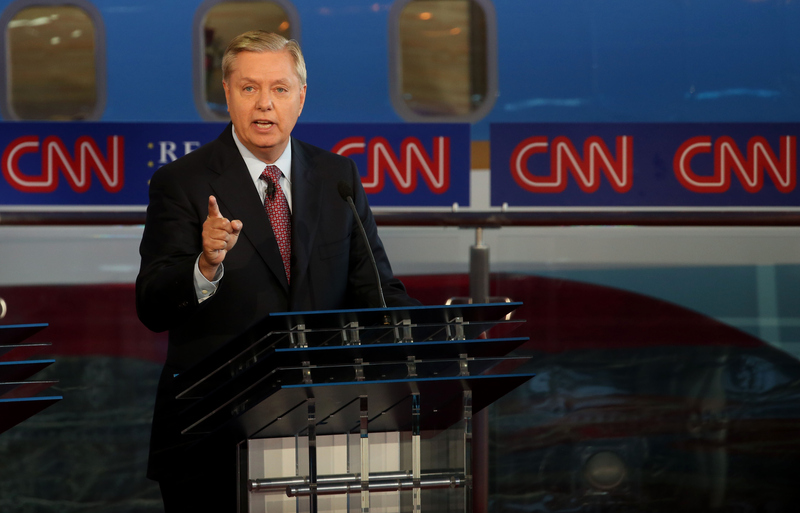 If it's a combination of pong who performed the best at the mini-debate, then Graham is a shoo-in.